Hi, my name is Thomas Pham, I’m living and working in Berlin and it’s my passion to bring web concepts to life. 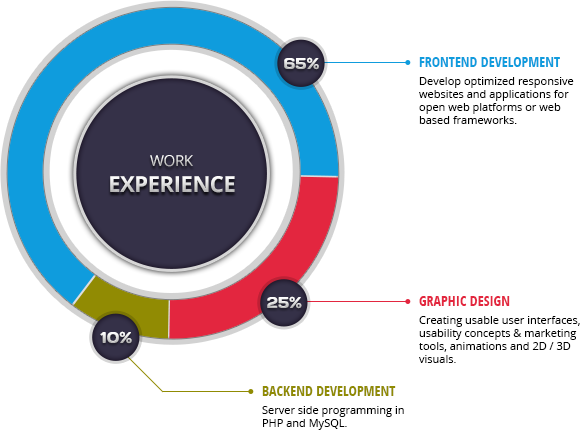 I aquired professional experience in design and web development by working on different projects for several years. So I founded my own web and media design agency and work as freelancer in different fields especially in the games industry. Currently I’m working here on different frontend projects and build responsive websites with the Symfony 2 Framework. I’m responsible for creating templates in Twig, Less and Scss. Here I was responsible for installation and administration of the company network. Creation and maintaining of the company websites was also part of my job, next to developing web tools for process optimisation and performance increase. I also created print promotions, signets and visual identities. In a small team I realised infotainment projects and visualisations for customer like ado and tropical islands.There I created interactive media presentations and websites and learned a lot about cg animation and visual effects. Here I was responsible for the administration of mail accounts, domains and web databases.I also created print promotions, make-over graphics and corporate designs. I attained deep knowledge in the tourism branch. In a small developer team I was responsibly for the installation and setup of the company network, as well as the installation and administration of their servers.Moreover, the production and support of company websites and the development of a dept collection system belonged to my duties. I founded my own web design and media agency. As freelancer I worked on several online and offline projects. To make my hobby the occupation, this was my aim. Hence, I decided for education as computer scientist by Deutsche Bahn AG.During 3 years of education I learned alot about hard- and software, programming languages, social competence and rules of conduct at the work on railway tracks.However, I decided to change the special field and educated myself further in Web development and design.